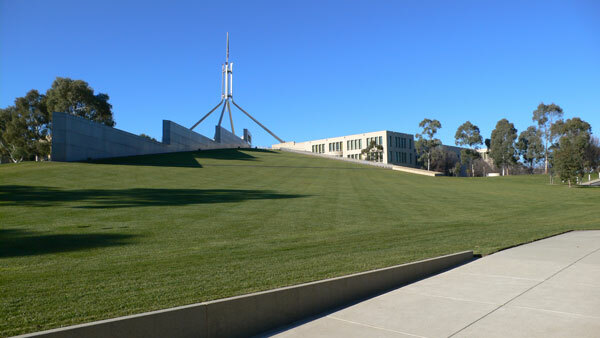 The Australian Parliament House was designed with the lawns on the roof. 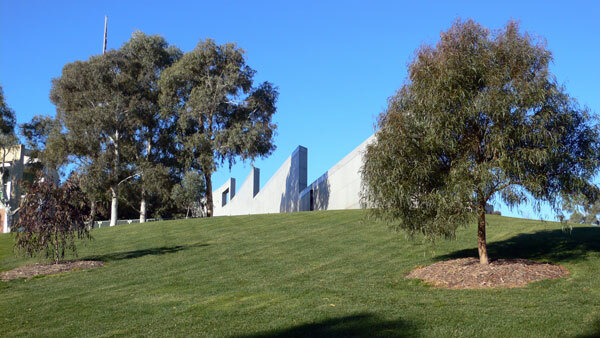 The architect wanted to remind the politicians of their place in society by allowing people to walk across the roof of Parliament House. I have proudly explained this to many visitors to Canberra. Overseas delegations have laughed and have congratulated us on having this as the philosophy behind the architecture of our national parliament. But the security experts were not happy. Several years ago, with the architect’s approval they introduced a ha-ha or two across the slopes to stop those evil people who they expect one day to drive up there. Earlier this year Romaldo Giurgola died knowing his fantastic piece of architect was basically in good shape. But they could not wait. 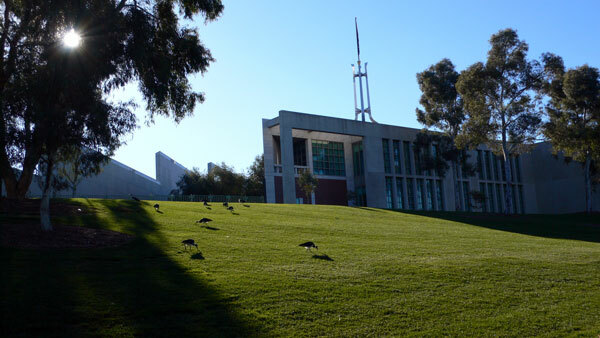 In December the ‘security experts’ have at last had their way and have convinced our politicians that the lawns across the top of Parliament should be off limits. Instead we are about to see the whole building ringed with a steel fence of some sort. Bloody hell – how did we come to this! Our politicians should be ashamed of themselves–and yes I am looking at all of them–including our locals Katy Gallagher, Andrew Leigh and all the others. They all voted this through the Parliament under the pretense that somehow this made the place more secure. What a joke! This building is one of the few remarkable architectural gems in the national capital – and is admired throughout the world. 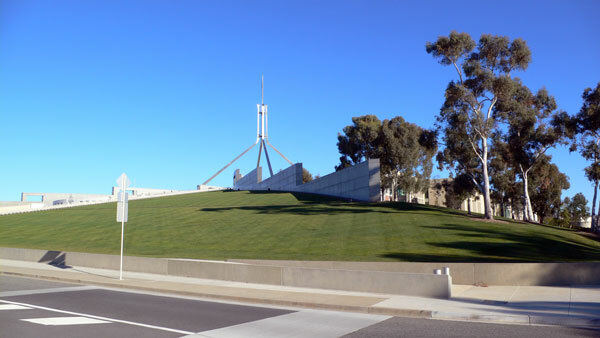 To think that our politicians now consider it good that the image of our national parliament is to be one where a steel fence is one of its key features. All around the world voters have been coming to the conclusion that our politicians are becoming even more remote to the issues of their electorates. They are seen as living in a world of privilege in which they are paying less and less attention to those who vote them in. People are looking for any sign that this may not be so. However I suggest that our federal politicians have just sent a message to all of us. Up there on the hill they do not welcome your attention and even more they have not appreciated the architecture of the building that allowed any of us mere mortals to think you could be above them – even for a moment. So bring on that steel fence! I wish more people could understand this insult to the architect, the wonderful Romaldo Giurgola, and to all of us. Was there no-one in the government and the opposition who could stop this act of vandalism and understand that this action is an insult to the culture of Australia and our famous laid-back way of life? Could they not see that this is a very public announcement that terrorism is winning – as they have just changed the public face of Australia’s democracy? Yes – I am not happy about this stupid decision. I hope there are a few more people out there who share this view.